Being the frugal shopper that I am, I did a little looking around. Turns out, you can purchase the repair service on eBay . Ship off your iPad with the broken digitizer, and the seller replaces the digitizer for you and then sends it back. The service that I ended up purchasing was a $79.99 service with a $10.98 shipping charge. Once it was all paid for and the iPad was back in my possession, it ended up costing me right at $100. If you’re doing the math right now, the $79.99 and $10.98 don’t really add up to $100. What I had failed to add in was that I would have to pay to have it shipped to the seller as well. Want to know how long the repaired digitizer lasted? If you guessed “less than 30 days”, you’re right! Yep. Sad isn’t it? After it got back from the first repair, I even put a fancy case on it from OtterBox, in hopes that it would keep it from having the same fate should it fall from the couch again. But, even that fancy case couldn’t save it from a trip down the hardwood stairs of our house. There’s something chilling about hearing the thuds of an iPad as it bounces down the stairs. I suppose that could be attributed to the three year old at the top of the stairs that could have just as easily been what was making the thud sounds. Luckily, it was just the iPad. I certainly didn’t want to pay another $100 a month later to have it repaired, so I did what any self respecting techie would do. I started doing research on repairing it myself. I could buy a replacement digitizer for about $50, and if I could figure out how to do it myself, I’d save 50% on the second screen repair. I watched a few youtube videos of repairs being done, and decided that it was worth a try. Worst case scenario, I failed and had to send it off, losing the $50 in parts and some time. Two hours of work later, and the iPad is good as new. Well, close anyways. The digitizer is replaced, the iPad is all put back together, and, miracle of miracles, it all works! I spent $100 to have someone else do the first repair. The second time, I spend $49 on the parts and did it myself. My savings on the repair were $51! It took me a bit under 2 hours, so I effectively “made” about $25 an hour. Not bad. Wages like that make me wonder if there isn’t money to be made in performing the service as a side hustle! Or, maybe buying busted iPads and replacing the parts and reselling them once they are fixed. Obviously, I have a technical background. I’ve been tinkering with computers for just about as long as I can remember, and spend most of last summer working part time at a computer repair store. I have the skills to do the repair myself. Which made it pretty easy to make the decision to do the repair myself. Someone without that background might want to think twice before attempting it. But, with the abundance of how-to videos on youtube, and all the information on the web, maybe it’s worth a try anyways. You can save some money on the repair, and learn a new skill! 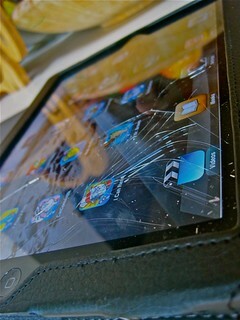 Have you ever done your own DIY repairs on something as costly as an iPad? How did it turn out? That is awesome info. We have a little one due this month and this is something that I have thought about. Its almost guaranteed that some piece of electronics is going to get broke in the next few years because of her so I need to know how to fix it without a huge price tag. A friend of mine repairs iPad and iPhone screens on the side. Makes $600-800 a WEEK. And (sadly for them!) most of his business comes from repeat customers. I think you could make a lot of money once people realize you’re out there providing those kind of repairs. @Sean Yeah, buy yourself a super-duty case for those bad boys. The new one I have now is a Survivor from Griffin. Military spec rated, although, if anyone can break a milspec case, it’s my kids! That’s great that you were able to do this. With instructions available so much on the internet, this is more feasible. Years and years ago, I attempted to ‘fix’ one of the very first CD players ever made. by that point, it had been handed down to me, but unfortunately I rendered it unusable. Great work! I have dropped my iPhone 4 several times and after the first repair I simply refused to get it fixed again. I tried doing the DIY for the iPhone but this thing is like a tank with all these little screws. I ended up “giving up! I have put in ceiling fans and other things just from Youtube videos and I have saved some serious cash. But sometimes I would rather just pay. The time it would take me to do it and i would rather some get paid. For certain things that is. And extra 18 months out of it. Loose connection?.